In the 1930s, tiny images of blimps, or in Russia, commonly referred to as “dirigibles,” appeared on numerous sets of Soviet postage stamps. After the airship Graf Zeppelin flew to Moscow in 1930, blimps generated enormous enthusiasm. For a short period, blimps seemed to be the transport of the future. Lighter-than-air ships had large passenger capacity and required little fuel for long, non-stop flights. The Soviet Union embarked on a vast program of airship construction. Plans were underway to build a large fleet of blimps named after Lenin. 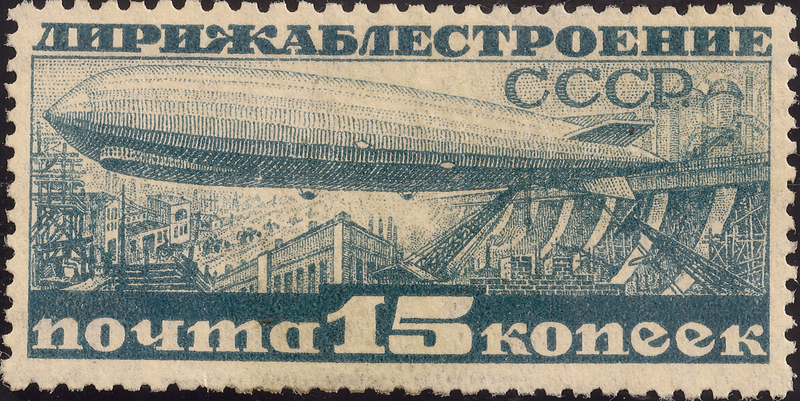 Soviet workers and collective farmers contributed 25 million rubles for the dream of the blimp fleet to come true. In 1932 a famous polar researcher and aircraft designer, Umberto Nobile, arrived to lead a state blimp project DIRIZHABLESTROI. The Soviet Union issued four stamps for use on mail carried on the polar flight of the Graf Zeppelin in July 1931. The stamps depict a polar bear watching the Graf Zeppelin flying over the Russian icebreaker Malygin. The disastrous explosion of the Hindenburg in 1937 brought the blimp era to an end. Airship Designs Set. Airship Designs. 1934. USSR. Scott#C53-7. Private American Collection.